Hellebore (Helleborus x hybridus) or lenten rose – named as the 2005 perennial plant of the year by the Perennial Plant Association – is one of the most attractive and longest-blooming shade perennials you can grow. Hellebores are evergreen members of the buttercup family, and they flower in late winter or early spring, depending on how cold your winters get. They are hardy in Zones 4 to 9 and tough enough to survive in Zone 3 if there is reliable snow cover. These plants are also deer- and vole-proof, and not at all disease-prone. Mature plants form clumps about 18 to 24 inches tall and 24 to 30 inches wide. Their long-lasting blooms come in many colors and single or double forms. In a mature clump, you can expect as many as 50 or more flowers per plant. Flower colors range from pure white to a deep plum, with in-between shades of pink, rose, magenta, cream, pale yellow or green. Flowers often show intricate contrasting spots on the inside of each cup-shaped bloom. There are semi-doubles to doubles and some forms with picotee edging, almost like fancy stitching. Hellebore flowers can last for two months or longer, followed by attractive seed pods. The plants have thick and sturdy leaves, divided into seven to nine segments resembling coarse leathery umbrellas. The leaves add a nice texture to the shade garden, and create a perfect backdrop for bulbs and other perennials. Lenten roses are the easiest Hellebores to grow, preferring an average to rich, well-drained soil with plenty of added compost. These plants do well in part to full shade. In hot summer regions, they prefer the shade of deciduous trees. In areas where summers are cool they will tolerate a fair amount of sun. 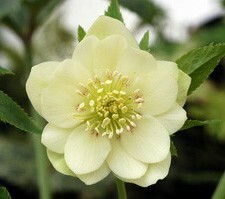 Hellebores are easy-care plants. Aside from providing shade, all you need to do is water them through dry summer periods. Although the foliage is evergreen, winter conditions leave the plants looking tattered by spring. The flowers appear at the first signs of milder weather, so prune old leaves to the ground, so the blooms and new leaves look their best. Use gloves when you cut Helleborus back because contact with the leaves can cause mild dermatitis in some people. It’s this same characteristic that keeps these perennials off the menu of hungry deer. Even specially-bred colour strains do not come 100 percent true, so it’s best to buy plants in bloom if you have your heart set on a specific form or color. Established clumps will often produce lots of seedlings on the ground below. You’ll see them in early to mid spring. If you want more plants, move the seedlings to a new location while they still small; otherwise the leaves of your existing patch will smother the seedlings. Young seedling plants may take two or three years to reach blooming size. Don’t be surprised if they flower in color that are different from the parent plant, since cross-pollination by insects usually means that each seedling is unique. You can divide mature plants in spring or fall, but they are slow to recover. It can take a couple of years for divisions to bounce back and flower well again. 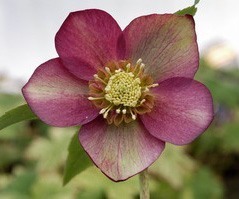 The lenten rose is a great hellebore for beginners. The beauty of its long-blooming flowers, easy-care nature, and the fact that it thrives in low light makes this a most rewarding shade perennial.